It's funny how a little "shopping" next door at my parents will always yield a treasure or two. Look at this wonderful tole tray that belonged to my grandmother. I am SO loving blue these days. 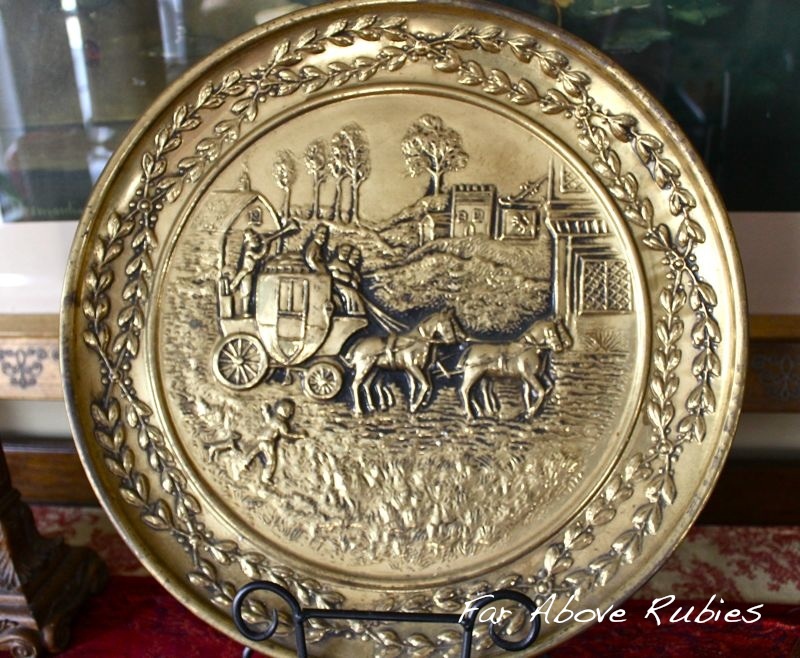 My mom had given me this brass-plated tin platter a while ago and I put it in the storage. Then, while watching an episode of "I Love Lucy" I noticed she had one in her Connecticut home on the mantle. Hmm. I remembered I had this one so I pulled it out. These were made in England so it does fit the English cottage style I have fallen into, but not sure where or how I will use it yet. I found the measuring tape in the guest house. I can only assume my grandfather dropped it there when they were dismantling the old house around 1960. 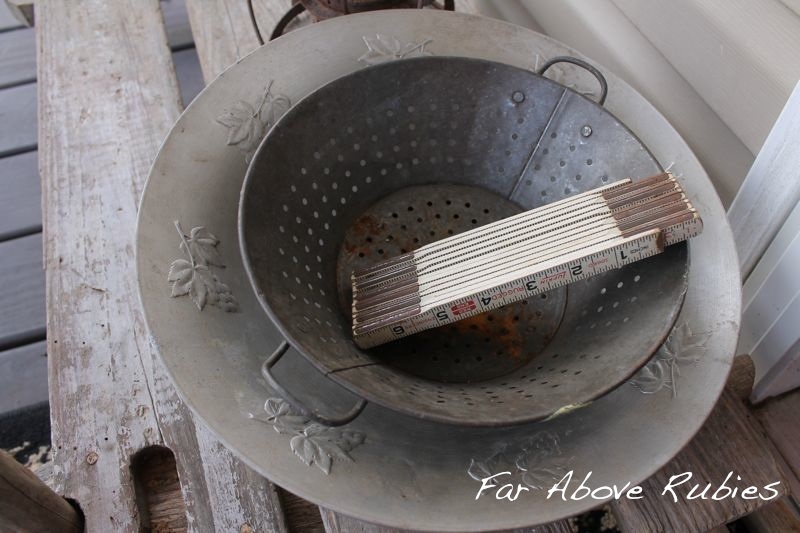 The colander and the other tin piece were in my parent's basement. Finally, a trip to the Goodwill yielded this amber lamp for $5. It has a night light in the middle part, but not sure I will keep that when I rewire it. I love it! I'm thinking 1970s. Not sure what form it will take after I take it apart for rewiring, but I can't wait to do something with it. It is so fun to find such great things. I looked back at some older posts and have to tell you that your homes is lovely and so inviting. I also enjoyed listening to your beautiful music. So many pretty things. You brought back some good memories of my childhood when you mention Lucys home in Connecticut. I dreamed of owning a home like that when I grew up, still do. Love the brass platter. Wow! Great finds Anita! And I loved your bathroom post. You are so blessed to have treasures passed down generations. Means so much more when everything has a sentimental story from loved ones. Oh and I recently found two of those measuring tapes... and SOOO thrilled because one of them is all metal. Way cool! You are so lucky to be able to "shop" for things owned by your family. Those are the best finds of all. Great finds Anita and whats even better is that it is something from family! Can't wait to see what you do with that lamp! Anita, you always 'find' the most beautiful and unique pieces!! My MIL just brought me some vintage floral nesting bowls that I am looking to use in my Spring decor. They belonged to my husband's late aunt; and I am excited to use them somewhere in our decor. Anita, I have a Toile black wooden serving tray above my living room couch that was my parent's....a wedding gift when they married(Charleston). I always loved it.When they moved back to SC they gifted to me. So many admired it.....but it isn't "walking", LOL. I love your tray and all the other items are so wonderful. The measuring fold up stick is priceless. The lamp is gorgeous and the runner it is with....thanks for sharing, Hugs, Emelia. 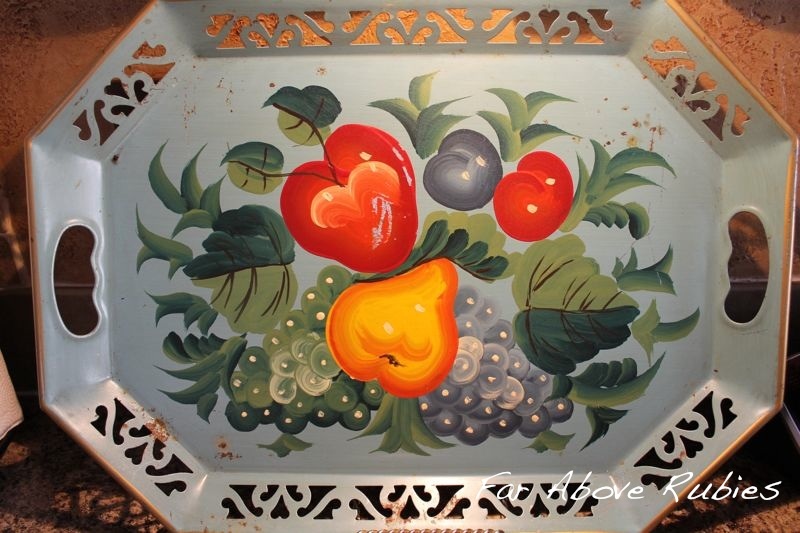 That's a great tray with the fruit on it as well as the finds at the guest house! It's fun to imagine what your family members had done with those items. The lamp definitely looks like the 70's! I'm visualizing what I'd do with the lamp! Lot's of possibilities! Oh my, that tin platter is so reminiscent of things on the wall in our house when I was young. That lamp is awesome. What a fantastic deal! I love Goodwill shopping. Love your tole tray. It looks similar to one I have and love. I saw some brass "plates/trays" at GW the other day. My mom used to have two on her wall...she had them from the 50s or 60s when I was growing up. I really like the metal colander. I can see so decorative uses for that. I think you found some treasures. Aside from the lamp, it's the kind of stuff I love to find at my mom's house. Wonderful treasures Anita. We have a few of those brass platters too. I have them hung around the house, and I love them. Cute platter. Look like next door is a great place to "shop" :)! 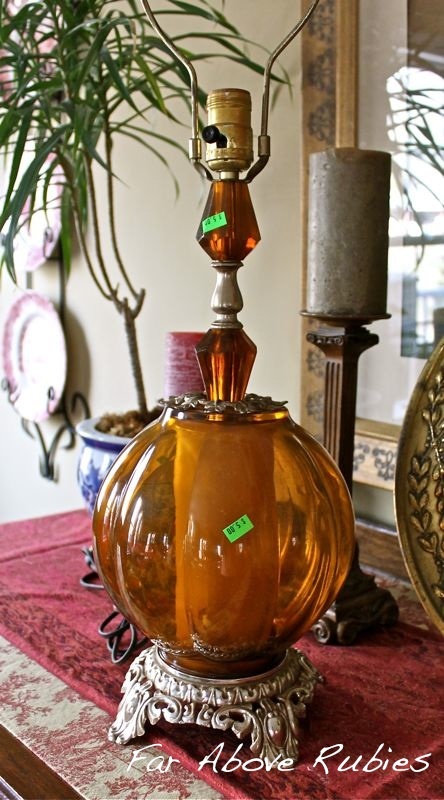 Love that amber lamp! It's just gorgeous. I love all the fruits painted on it.